this will be the final chapter of a series of three articles about my work for German Doctors. If you missed the first two and would like to know what I was writing about click HERE for Part I and for Part II click HERE. Today I will tell you something about my anxieties and fears as well as my dreams, wishes and hopes. In August I started my journey and the first big step was to go to the Philippines and work for German Doctors. For years I thought about working for an NGO and finally the day came where I left and made it come true. I was scared, nervous and my mind was full with thoughts like… Am I able to do this job? What will be my experiences? Can I cope with all the sad things I will see? What if I am not good enough? What if I fail? How will that change me? I will try to answer all those questions in this article. I was afraid, because I didn’t know what was coming exactly. But isn’t it always like that? When you make a decision and you jump just right into the new and unknown? Yes it is and by doing so you grow and develop, you make new experiences, you make a difference. In the normal clinic days back home I am always alone with one patient and there it was normal to have at least 30 people if not more standing around and watching me pulling teeth. To answer my first and fifth question from above. Yes I was able to do my job, sometimes not under the best conditions, but its working and that is what counts. Extracting teeth out in remote villages with just the basic instruments isn’t the easiest thing to do and yes sometimes I was not able to take every tiny root rest out, but it doesn’t really matter. And it doesn’t mean I failed, no I didn’t, because I tried and gave my best and the patients still appreciated it! One day there was a really scary moment while I treated a patient. I was actually planning to extract three molars in a row in the lower jaw. After pulling two teeth out, I noticed that it was bleeding quite a bit so I decided not to take out the third one too. I placed some cotton and let the patient sit close by to have a look on her again later. Half an hour passed by and I checked and it was still bleeding heavily. I placed new cotton and let the patient sit again. Again half an hour later nothing had changed so I decided on stitching up the wound. And now please keep in mind that at least 30 people were watching me and I had an emergency situation there. Taking the cotton off the wound and having a bleeding which is so bad that I could hardly see the margin of the gingiva to put my needle through, that makes me nervous. I think everybody will agree on that. And if one bloody swab after another comes out of the mouth and gets thrown in a cardboard box the people watching know there is something serious going on. But I needed to stay calm and do what I have to do. After having 3 stitches in place it still continued bleeding WHAT??? …. time for the emergency kit and adrenaline. After step by step putting adrenaline on a small cotton pellet and pressing it onto the wound the bleeding finally stopped :) and hey for all my dentist friends who read this… I needed to empty a whole ampule of it!!!! You can imagine that I was happy to have the deserved lunch break! But not only medical situations can be very scary! The region in Mindanao where we go with the rolling clinic is not the safest one. I don’t know, if you know, but there are conflicts going on, but German Doctors never goes in regions where it would endanger the team! Despite that fact, we once were stopped by military to ask where we were going and another time I lifted my head while working and there was this man standing with a machine gun in his hand right in front of my dental chair. Weird and what a bizarre situation .. I was asking myself … in what movie am I? Anyway he went away and that was that! 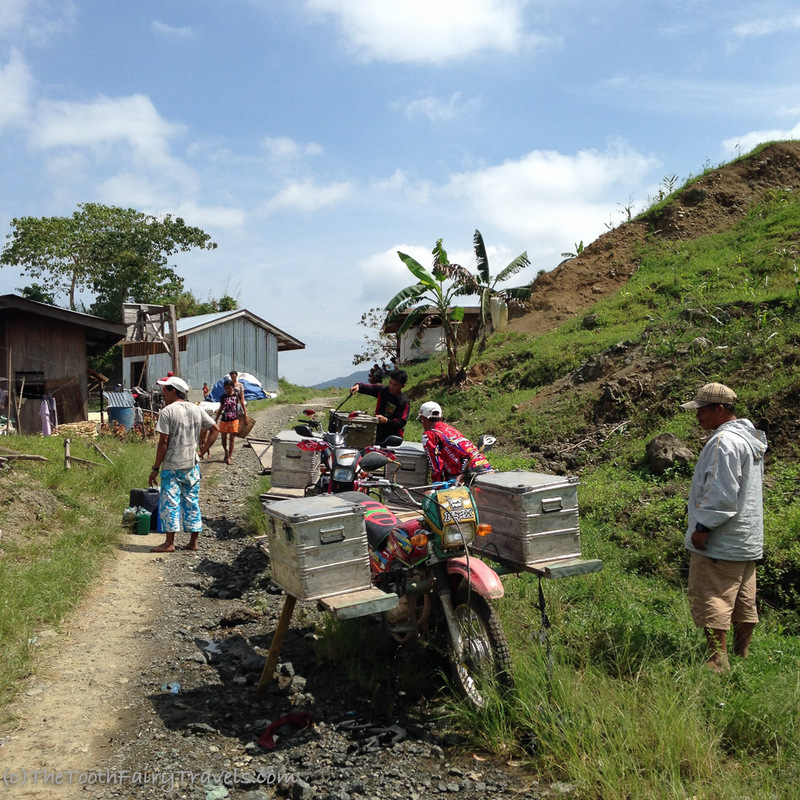 Sometimes we also went to regions where we needed to leave the pick up truck behind and changed onto a motorbike to reach the people in need. Those bikes have wings and carry all the equipment and the team too :) to take a road which can hardly be considered a road and which are difficult to pass, deep,gravely damaged, muddy trails up and down the hills. In general I love to ride motorbikes, but this was really scary for me. Why? Nothing happened to us and we reached the village to treat the poorest of the poor! Its worth every effort and difficulty to overcome. Talking about fears and anxieties …. I know that my field of work is not the most beloved one within medicine. :) but one thing I can tell… the people of the Philippines are brave hearts :) They come, sit down, get the injection without any topical anesthesia and they just take it. Even my beloved little fellows, some I needed to treat only 5 years old, were unbelievable cool. 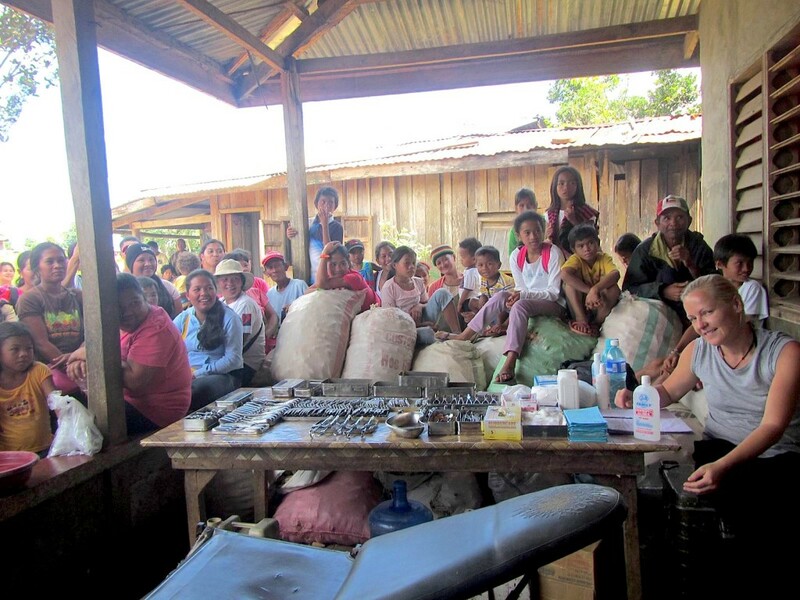 For the inhabitants of those remote villages to go to a dentist is not the most feared situation. From what I am assuming, their worries and fears are more concentrated on what and when they get something to eat! What is for us the easiest thing to get by walking straight into a supermarket and do some groceries shopping is for them not a matter of fact at all! I asked myself earlier the question how do I cope with all the things I have seen and experienced?! One way is to write it down and let you read about it! Knowing that I was born in a different world with all the privileges I have and knowing that the people over there have much more difficult things to cope with, that makes my coping very easy, because I know they get through much worse situations than I ever need to. I am very often thinking back of my time over there in this beautiful country with this amazing people. I know that I made a difference and my fears at the beginning were normal and I got over them, it made me stronger in a way. And it puts certain things in the right perspective again. I, we … should every now and then just look at all the things we have, we own, we are able to do.. and appreciate it and not constantly complain about tiny issues which at the end aren’t any issues at all! 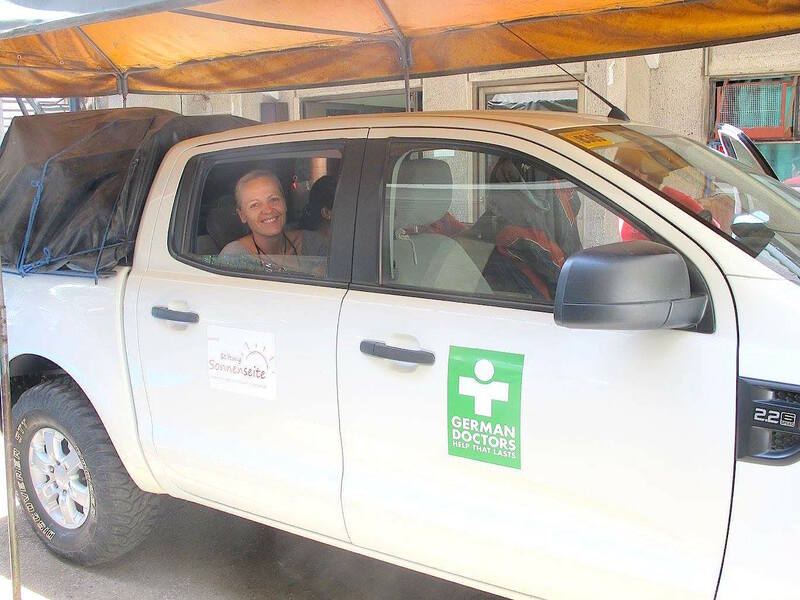 I am very glad that I got the opportunity to work for German Doctors and I wish I can be back soon – thanks German Doctors it was a pleasure to be on board of the rolling clinic and to help in the Mindanao and Mindoro project! For the people of the Philippines,especially the children, I hope that one day there will be big changes in your country and till then … German Doctors will be there for you with all the doctors who decide on helping where its needed! I hope that you, my readers support me with the fundraising for these amazing projects I worked for. check out my latest challenge and don’t forget to press the make a donation button. to all my beloved readers :) stay happy and healthy. I will be back soon with the next adventures of the tooth fairy travels from Borneo and Indonesia.